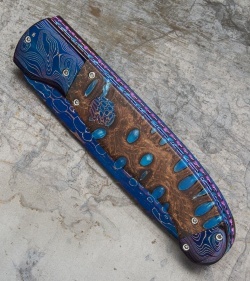 This custom Titan automatic knife offers a fine hand-made design by Rainy Vallotton. 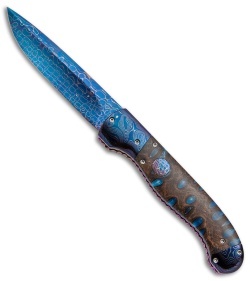 It has a Chad Nichols "Lizard Skin" Damascus blade and "Boomerang" bolsters. 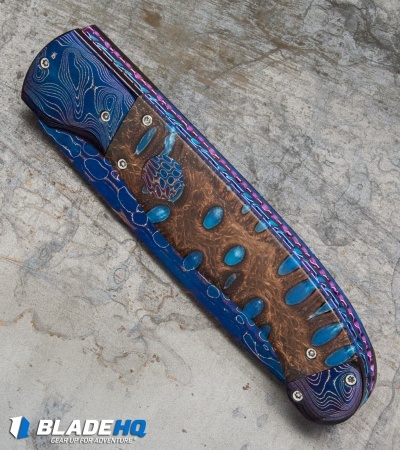 The handle features highly unique blue resin burl scales, purple anodized titanium liners and a stainless steel backspacer. 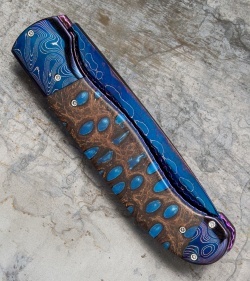 The liners and backspacer are filed, adding a nice touch and texture to the knife. This Titan model is equipped with a floating titanium back spring for fast and reliable opening action.